Today I’d like to share the work of my 4 year old. Now I’m not sharing his work because he is an amazing artist, or because I want to sell his work or anything (although you’re welcome to buy it). I share it because of something he had written at the bottom of the page. Now at first glance that is a very silly thing to say. It seems just like the type of thing a 4 year old would say. Except that this is actually a very deep theological statement, it’s just said in “Hudsonese”. The past few weeks Hudson keeps talking about his grandpa, my dad, who died when he was just a few months old. He keeps talking about how he misses grandpa and wants to see him. So he asked where grandpa is, and I told him “Grandpa is in heaven”. We talked about this and the point he got was that God, because his love is so strong, can take us to heaven. And that heaven is far away, like the North Pole. 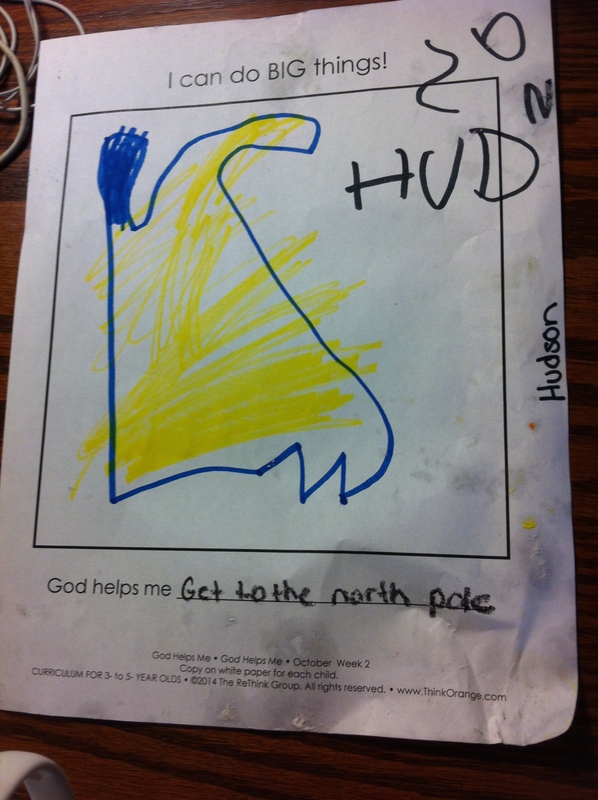 So when Hudson says God can help us get to the North Pole, it’s a comment on the power of God. That God is able to get us places we couldn’t get on our own. That the love of God is strong enough to draw us to heaven, and to bring heaven here. That God’s loving power is enough to do amazing things: like get us to heaven, bring reconciliation, cause resurrection, bring healing, bring hope, bring transformation, and of course, get us to the North Pole. While you might not see the phrase, “God helps me get to the North Pole” in any theology textbooks, it’s still a true statement. And may that statement give you hope today, just like it gives Hudson hope. That God’s love, power, and strength can change lives – and apparently get you to the North Pole. Previous Blood, Sacrifice, and Atonement ~ What’s it all mean?